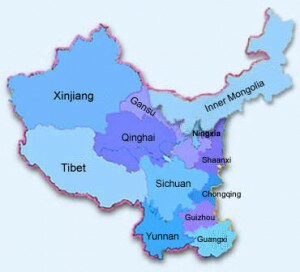 Proclamation of China’s “Great Western Development” policy (Xi Bu Da Kaifa) in June 1999 signaled a major escalation in resources and attention focused on decreasing the development gap between the east coast powerhouses and the twelve inland provinces of the increasingly lagging western region. Comparing the economic performance of east coast and western provinces based on gross domestic product (GDP) generated from 1980-2000 finds the ratio gap increased steadily from 2.98% to 4.33% – a clear indication of the yawning disparity divide. The critical question remains as to whether preferential policies will prove sufficient to transform western areas by utilizing strategies developed elsewhere. This article examines evidence from two of the three major cities in western China: Chongqing, since March 1997 a national-level municipality with the largest area and population in China, and Chengdu, the historic capital of Sichuan province and close neighbor to the west of Chongqing. Within the western region these two cities rank first and second (respectively) in GDP in 1999, or 8th and 12th for urban areas within China. Government policies formulated to favor the West in the modern period impacted Chongqing when that city became the capital of the Nationalist Chinese government, by virtue of its mountain fastness, following the Japanese invasion. The cities of Xi’an, Chengdu, and its suburb “Technology City” Mianyang remain the most advanced research bases in west China for products with high technology inputs. With a core city population of 3.4 million (metropolitan population 10 million) in 2003, Chengdu continues to be the historic, cultural, and economic capital of Sichuan province. Its location complements the Yangtze Basin-oriented role of Chongqing by looking toward other regions in southwestern China. As the urban hub of a province with 43 universities and 1.2 million scientists and engineers, and the home of Sichuan University with 60,000 students, Chengdu attracts transnational corporations specializing in high technology projects. Chengdu ranks the third place in China’s technology-related sales revenue from its park. Plans for both nearby cities include greatly improving transportation links between them so that they can complement each other as tent poles raising the level of western development by linking to air, water, and surface transportation routes. Internally each city is designated for upgrades in their logistics infrastructure, public services, and roads. Development challenges continue to be particularly persistent in areas most important for nurturing a technology base: low educational attainment, poor institutional reform, restrictive old thought patterns, insufficient internal and linkage infrastructure, an economic base strongly reliant on state owned enterprises, and insufficient attention to designing policy mindful of local and regional differences. Overall, at this initial first five-year stage of West China development policy, Chengdu’s historical development edge marks it for continued success as the innovation leader. Chongqing falls behind in a variety of important markers. The number of college students (especially research graduates) and affiliated academicians is proportionately much higher in Chengdu. Sichuan University is heavily involved in both innovative business incubators in the area and companies utilizing high technology for domestic and foreign markets. Chengdu remains the more outward-oriented intellectual and foreign investment capital, outranking Chongqing by having more than double the amount of foreign direct investment from 1999-2001. Chongqing is favorably tied to its geographical edge as a river shipping port linked now to the east through the tamed Yangtze and as a military-industrial base with transferable technology, similar to Xi’an. This unique link may end up defining Chongqing’s position, while Chengdu’s entrepreneurial intellectual edge fits it for a new economic base.